Some good Boxing Day Sale results | A blog about smart POS software for independent small businesses. 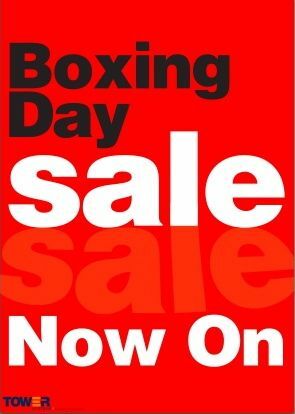 We have received reports of some excellent Boxing Day Sale results over the last five days. Some retailers using our Point of Sale software have reported sales up as much as 50% on the excellent results from the previous year. While the news has stories of the numbers from Myer, David Jones and other majors, from where we sit there are plenty of small business retailers with excellent results so far from this year’s Boxing Day Sales. We have glad to have played a role, however small, in assisting this. From assisting with handling pricing during the sale through our software too providing two professional posters for our retailers to use, Tower Systems has offered proactive support and assistance to retailers in our community who wanted to leverage the Boxing Day Sale opportunity. We appreciate opportunities to demonstrate support and assistance beyond what is usually delivered by software companies. We are ready for a busy New Year’s Eve today as retailers turn their attention to trade through the first weeks of January. Today tends to be quiet in retail stores as shoppers are busy with preparations for New Year’s Eve parties. Retailers often use the day to prepare for January trading. Today, our after hours support numbers are live and ready to offer our customers assistance with urgent queries. The after hours numbers are backed up by emergency numbers offering more senior assistance to our customers. Good Point of Sale software, used well and with commitment (this is crucial), offers excellent opportunities for a retail business to reduce the risk of business failure. Cutting theft. Theft can kill a retail business. Using our theft tracking, management and reduction tools enables retailers to reduce the impact of theft, especially employee theft, on the business. We have seen businesses eliminate hundreds of dollars in employee theft a week by following our advice. We look at hidden data and provide advice on steps to take. Being certain of performance. By knowing exactly what is working and what is not working, retailers are able to make fact-based decisions. We have been fortunate to be in a position to compare gut-feel decisions with the opportunity of fact-based decisions and the latter always wins out. In a couple of instances recently retailers were able to save mistakes which could have cost them thousands. Driving sales. By making it easier to identify retail hot spots, retailers are able to drive this success even further. Retailers are able to use hot products to sell other products – through tactical adjacencies. We have reports which can help identify and track these opportunities. Managing employees. Labour is is usually the most expensive or second most expensive cost for a retail business. labour managed poorly can impose a high cost on the business. Labour managed well can drive business success. Our Point of Sale software enables retailers to more completely manage, guide and leverage their labour force. Respecting cash. In many points in a retail business cash can be abused. By respecting cash from the sales counter through the back office and into the bank the business owner can rest comfortably knowing that Point of Sale software is reducing the opportunity for mistakes and fraud. Retailers can rely on Point of Sale software from Tower Systems to drive better business outcomes and insure their business against tough times. retailers who embrace all that our Point of Sale offers set themselves up for greater success regardless of the economic challenges swirling around them. The key is proactive engagement. This is where we help. Beyond the support call, we can assist retailers to genuinely leverage their Point of Sale software make make the most of business every day. We have business advisors who will willingly help our retail customers to leverage their software for valuable success. Retailers are responding to our encouragement that they use this time between Christmas and New Year to undertake some ‘spring’ cleaning. We’re pleased to be able to help with advice and assistance on this … preparing their businesses for more accurate tracking of business performance in 2012. It is vital the retailers own the quality of their business data. No amount of automated work can match the value of business owner and manager engagement with their business data. It’s our belief that your Point of Sale system and the business data which it manages and cultivates is only as good as the investment you make in it. We have found ourselves with more people on the help desk than we need today and so have placed some on the road visiting customers to provide free face to face visits. These visits are designed to answer queries, provide extra training and generally ensure that the enjoyment we promise flows from our software does actually flow. We’re calling in advance to ensure that we don’t catch people when they don’t have time to see us. Live, in store, training in our Jeweller software. Easy access to software updates. Regular free online training workshops. Fast, accurate and reliable Point of Sale processing. Jewellers using the Swim jeweller software are welcome to contact the Tower Systems sales team to discuss how to switch. We have been getting plenty of calls from newsagents today as they prepare for Back to School sales commencing early in the New Year. While the GNS back to School catalogue file is not out of the embargo imposed by GNS, we are releasing this to newsagencies individually. This way we honour our commitment to to not publish the file on our website as made to GNS while ensuring that customers who do want to set this catalogue up now can do so. With more newsagents using our software than any other newsagency software we can be easily swamped with calls from newsagents keen to get things like back to School properly setup. 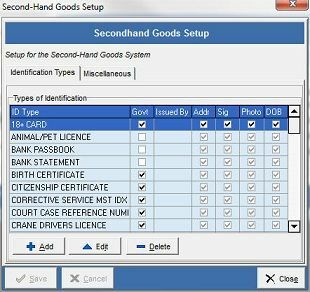 Thanks to the secondhand goods facilities in our Point of Sale software, retailers who deal in secondhand goods are able to track purchases and sales of all secondhand items. We meet the data gathering and reporting requirements of the New South Wales police. We do this with great care over gathering appropriate data to ensure accurate record keeping and reporting. Secondhand goods stores tend to get busy after Christmas, making the next couple of weeks busy for users of our secondhand goods software. Using software to tracking especially the purchasing of secondhand goods is vital for retailers keen for accurate record keeping which follows the rules. In developing our new Second-hand Goods Software, we ensured that we delivered flexibility to meet the tracking, reporting and other business requirements of our existing customers trading in second-hand goods and those we would like to welcome to our customer community. We also ensured that we met the legal reporting and tracking requirements for dealing in second-hand goods. The result is software for the professional second-hand goods business, regardless of whether they operate solely in this space or whether second-hand goods are just part of their portfolio of products and services on offer. We’re here, live at the Tower Systems Point of Sale software help desk, ready to help retailers using our Point of Sale software. While we have offered access to our after hours network of experts through Christmas, today is the first day back with our in-office live Help Desk since Christmas Eve. Already we’ve had some calls this morning. Nothing urgent or critical, just questions relating to handling matters relating to public holidays and up coming sales. We have a full desk of support people this week – to ensure an excellent experience for retailers who, like us, are working through. We are demonstrating the value of a multiple access points for Point of Sale software support today. We have had customers with non urgent queries email in questions and receive answers already this morning. They didn’t call the after hours numbers as the matters weren’t urgent and while they were happy to wait until tomorrow for an answer, we have provided an answer today. Retailers using our Point of Sale software can access support via email, website communication, mobile phone as well as through our Help Desk (capital city numbers for Australia and toll free in NZ). This multiple access point approach to support demonstrates our commitment to accessible support. It’s easy for software companies to say they offer good support and another thing entirely to deliver on this. Many of our customers will today get through more transactions using our Point of Sale software than on any other day in the last year. It’s a great test for our software and the efficiency and accuracy it brings to the sales counter. Good retailers will have used our software to prepare for the day, using facilities in the software to pre-set pricing and any package deals. Some will have even tweaked hot butting on our touch screen layout to ensure ideal sales processing for the busy day. Those who have been using our software for a while can easily go back and look at data from previous Boxing Day sales and use this to set rosters and to guide pricing as well as other business decisions. Being so busy means that it could be possible for business processes to relax, just to get customers through. Thanks to our software, businesses can use it to ensure business rules around discounting, refunds and other possible points of fraud are enforced. We are running Boxing Day Sales in our own retail businesses, all five of them so we will have personal experience on which to draw. To backup our customers, the 2,500+ of them, we are on deck today offering support for urgent queries. Our network of mobile phones will be live and ready to handle calls. While all of our after hours and emergency support numbers are live and ready for calls, our office based Saturday support is on summer its usual hiatus for the next few weeks. Retailers using our Point of Sale software can call the after nouns numbers listed at our website, in our newsletter and in our weekly email newsletter. We have a terrific day yesterday, the last office day before Christmas. It was a relaxed environment, little in the way of call traffic, plenty of calls of good cheer. It was a lot of fun and a nice way to ease into the Christmas season. It was wonderful talking with customers and sharing some Christmas cheer while handling last-minute queries. It was also terrific catching up with team members here and interstate. Lots of laughs and plenty of Christmas cheer. Check out this video of someone walking in off the street and stealing two snow globes from the reception desk of our office earlier this week. Untitled from mark fletcher on Vimeo. The desk is rarely unattended. What is most chilling is that they appeared to know exactly what they wanted. As a result, security is being beefed up. With call traffic slowing on this last weekday business day before Christmas, we are taking an opportunity to have a few drinks here at our head Office with team members over a lunch. We’re still fielding calls as they come in, ensuring that our customers are taken care of. But we’re also enjoying the social opportunity with each other. Our help desk call traffic is up this year thanks to a significant increase in our customer base. Increasing customer penetration across all marketplaces in which we serve we have happily handled the call traffic which comes with settling in new customers. Help desk call traffic from new customers is the type of call traffic any software company would want – especially when the call traffic is coming from a range of marketplaces. Being spread in this way is good for business in terms of spreading risk as well as gaining from learnings from different businesses. In our call management reports we are able to see the impact of new customers on call traffic. It’s another indicator of a growing healthy business. We have been able to put our Point of Sale software Help Desk through several advanced training workshops this past week. With call traffic low due to busy Christmas sales, we seized the opportunity to undertake some internal training delivered by specialists in our business. The advanced level training had better equipped Help Desk team members in key areas of the software and therefore better positioned them in delivering for our customers. We seek out opportunities such as this, providing training for our Help Desk team members. Too often software companies put people on a Help Desk and rely on their general computer knowledge to get them through. That doesn’t cut it. What we sell and support is specialist software and this requires specialist support knowledge and skills. With call traffic set to be low between Christmas and New Year we will grab more training opportunities next week. With Christmas trading at its peak, our Point of Sale software has been in high use by retailers keen to track sales performance for this year compared to previous years. In addition to traditional department and category level comparative reporting, retailers using our software are able to easily compare the performance of suppliers. This is proving to be useful given changes made to product mixes by some suppliers this year. Our POS software also offers what is called MAT reporting, Moving Annual Total. This metric is used in big business as well as in many smaller smart retail businesses. It provides an up to the moment year on year comparison. We have MAT reporting in several key management reports. The key to good business reporting in Point of Sale software is to make it easy to access and run. With many people in a retail business needing access to business performance data and some of these not having formal business training, it is vital that valuable business data can be accessed without the need for complex training. This is where the Tower Systems Point of sale software shines. Our reporting tools are easily accessed, simple to follow yet powerful in what they report. The result for anyone accessing one of our business management reports is empowerment through knowledge. As active retailers ourselves we understand the importance of good business reporting and support this with regular enhancements to our reporting suite. 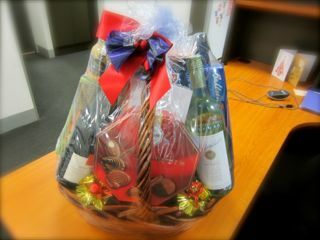 We have received some wonderful hampers as gifts from suppliers this Christmas. In in keeping with tradition have opened these up for all our team members to share. We are lucky to have such generous suppliers. It’s at this time of the year, we we reflect on the year which is coming to an end, when we get to think about supplier relationships and assess their value. While the christmas hampers are wonderful, what we cherish even more so is the day to day relationship we have with each supplier. Their support is genuinely appreciated by us and, indirectly, our customers. By dealing with national companies with respected and recognised brands we are able to offer a level of support, assistance and comfort to our customers which goes beyond a competitive price. Indeed, the quality, timeliness and value of after sales service is what really demonstrates value in so much of what we can do for our customers and we thank our suppliers for that. Our investment in more Point of Sale software Help Desk staff and better Help Desk infrastructure have paid off this year with an increase in our market share in each marketplace in which we serve. We end 2012 having achieved an excellent sales result. We know from new customer feedback that our reputation on customer service is a key factor in this sales growth. The increased market share in the newsagency channel is especially exciting given our already dominant position in that marketplace. It is not uncommon to see market leaders drop the ball and lose market share. The opposite is our experience – we seize every opportunity to demonstrate out commitment to newsagents and this often results in market share growth. We look forward to 2012 and further investment in our Help Desk and broader customer service infrastructure. Spending has commenced on initiatives we will announce in the new year. We have finalised our January 2012 Point of Sale software users newsletter so that it will arrive in the mail just prior to the start of the 2012. We’re excited about several news items in the newsletter which we are sure our customers will be thrilled to read. They play to our strength and reinforce valuable points of difference. We’re not about to tell here … be sure to look out for our january 2012 newsletter next week. We are hearing terrific reports from customers about sales of branded gift cards for Christmas. These are gift cards which they have had made specifically for their businesses for use with our software. In most cases the cards were designed by our creative team as part of a gift card service we offer. We have heard of these gift cards adding thousands of dollars in pre-Christmas sales. That’s excellent news. Beyond providing attractive and commercially valuable cards, our Point of Sale software manages each gift card, the balance and rules associated with accessing the balance. Our customers like having their own branded gift cards as they more actively promote their business. Amid the hubbub of week before Christmas trade, some of our retail customers are preparing for massive sales starting on Boxing Day. Using the catalogue facilities in our Point of Sale software our customers are able to queue up price changes which will kick in automatically on Boxing Day. By getting this work done in advance, our customers are able to better use their time in-store to create displays and collateral with which to promote the sale. Our catalogue facility is comprehensive, enabling retailers to engage with several types of date and time based over the counter offers. It really shines for key sale seasons such as the Boxing Day sales. Being able to effectively queue price changes enables retailers to schedule the work for when it is most appropriately done to best suit the needs of the business. We have just helped another retailer uncover and resolve a situation of employee theft. What started as a query about data in our software soon morphed into a professional investigation into systematic fraud. Thanks to the excellent audit tools in our Point of Sale software we were able to pinpoint the employee stealing from the business. This was achieved thanks to a hidden and secure log of data managed by our POS software. Without knowledge of the situation, our analysis of the data from the retail business enabled us to provide information in a form which, if tested in court, would stand up to cross-examination for accuracy in pointing to the employee responsible. We don’t like catching people stealing from a retail business using our software. However, we do gain satisfaction when we do discover this and the person responsible admits the theft. We know from studies that retailers can lose between 3% and 5% of turnover in theft each year. This can be reduced by retailers using our Point of Sale software if they use the tools available to them in the software to protect the business against theft. Retailers who do not use the theft prevention tools in our POS software can at least rely on the investigative tools to gather evidence of theft and act after the event. We have been busy scheduling training for jewellers and bike retailers pin New Zealand who are using our repairs management software. This training will be delivered WebEx as this enables us to easily cover the needs up and down the country. We are committed to running as many training sessions as our customers want … and at no cost. This training for jewellers and bike retailers using our software is part of our enhanced engagement with our NZ based customers. It’s something we have taken the initiative to organise, chasing our customers and encouraging them to take up the offer of free training.